What Happens if You Have a NYSLRS Loan and Go Off Payroll? Borrowing against your contributions is just one of the services available to eligible members of The New York State & Local Retirement System (NYSLRS). But what happens if you have an outstanding loan, go off the payroll and your automatic loan payments are discontinued before the loan is paid off? The answer is….it depends. If you leave your job because you’re retiring, then your benefit will be permanently reduced – you can’t pay off your loan once you’re retired. However, if you leave work for any other reason, you are required to make direct payment at least quarterly and complete repayment within five years from the date the loan was issued. If you fail to meet either of these conditions, your loan will default. What Happens If My Loan Defaults? We must report your outstanding balance, minus any previously taxed amount, to the IRS as a distribution to you. You still owe the balance to the Retirement System and the loan continues to accrue interest and insurance charges until it’s paid in full. We cannot issue a new loan until the defaulted loan has been repaid. For more information about loans, you can contact us using our secure email form: www.emailNYSLRS.com. One of our representatives will respond back to you within 3 to 5 business days. Content last revised December 5, 2017. This entry was posted in General News, Members, Retirees and tagged ERS, Loan repayment, Loans, members, New York State & Local Retirement System, NYSLRS, outstanding loan, PFRS, Preparing to Retire, retirement, retirement planning on March 25, 2015 by NYSLRS. Your retirement benefit from the New York State & Local Retirement System (NYSLRS) isn’t subject to New York State income tax, but it is subject to federal income tax. The W-4P form determines withholdings from your pension payments. NYSLRS takes care of your estimated tax payment requirement by withholding money from your pension based on your W-4P. If you’re receiving a NYSLRS pension, you need to file a W-4P to determine how much to withhold. If you don’t have enough withheld from your retirement income during the year, you could find yourself owing the Internal Revenue Service (IRS) extra in interest and penalties when you file your tax return. You can submit a new W-4P form whenever you want as your life circumstances change. Don’t know how much you want withheld from your pension? Our Withholding Tax Calculator can help you figure out the amount. If you need to update your withholding status, you can send us an updated W-4P form. Make sure you check out our W-4P tutorial if you have questions about filling out the form. If you have questions about your 1099-R tax form – the form that reports your pension distributions from us – our 1099-R tutorial can help. If you are a retiree receiving regular monthly pension checks from NYSLRS, you may also want to read our Frequently Asked Questions dealing with taxes and your retirement benefit. And if you ever have any other retirement-related questions that we can assist you with, please don’t hesitate to contact us via this email form: https://nysosc9.osc.state.ny.us/product/ccsub.nsf/fsWeb?OpenFrameset. One of our representatives will respond back to you within 3 to 5 business days. Content last revised February 24, 2017. This entry was posted in General News, NYSLRS Retirees, Retirees and tagged ERS, Information is the Key, New York State & Local Retirement System, NYSLRS, NYSLRS Retirees, PFRS, retirement, Tax, W-4P on March 18, 2015 by NYSLRS. What is the New York State Employees Survivor’s Benefit Program? Members of the New York State and Local Retirement System (NYSLRS) become eligible for a death benefit after one year of service. However, if you’re a New York State employee (meaning that you work for the State of New York), your beneficiary can also receive a death benefit from the Survivor’s Benefit Program for State employees. There are also other eligibility requirements for the Survivor’s Benefit Program. is less than one-half of your annual salary, or if you don’t qualify for any ordinary death benefit payment. The maximum amount payable to your beneficiary is $10,000; the minimum amount is $2,000. Both amounts include the ordinary death benefit paid by NYSLRS plus your survivor benefit. If your beneficiary is eligible to receive a NYSLRS ordinary death benefit of more than $10,000, this program will not provide any additional benefit. Also, if NYSLRS pays an accidental death benefit, a $2,000 survivor’s benefit will also be paid to your beneficiary. 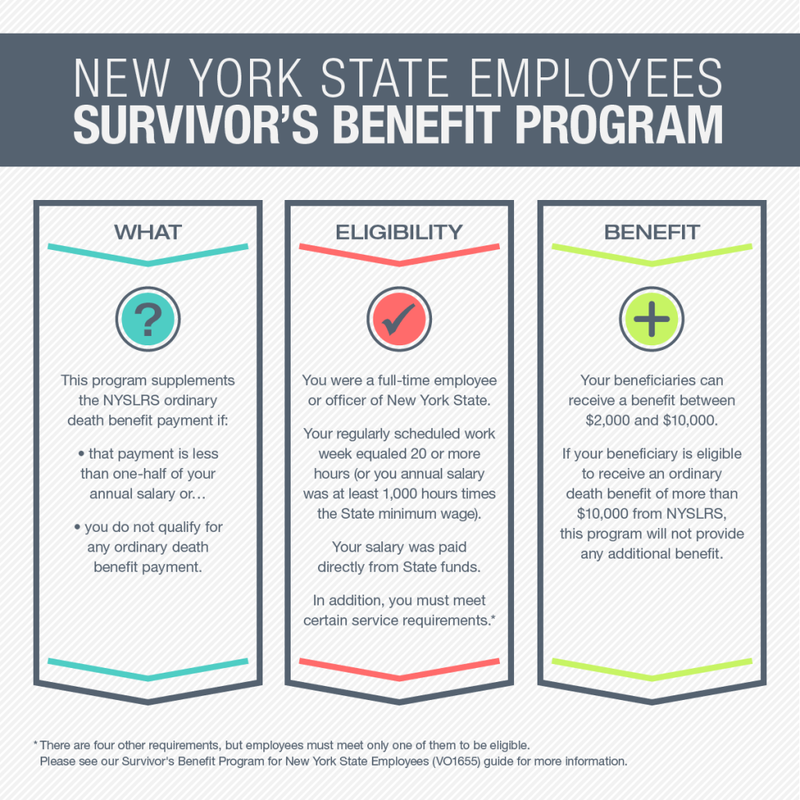 If you have questions about the program, read our publication, The Survivor’s Benefit Program for New York State Employees. If you have questions about any other retirement-related matters, please contact us. Content last revised May 18, 2018. This entry was posted in General News, Members and tagged benefits, ERS, know your benefits, members, New York State & Local Retirement System, NYSLRS, PFRS, Survivor's Benefit Program on March 4, 2015 by NYSLRS.